Natural light can be difficult at best. When I'm photographing flowers on a sunny day, the lighting can be so harsh by 10am or so that I would pack up and go home if it weren't for diffusers. These wonderful devices can help extend my day as long as I want. A diffuser is simply a large, white translucent screen that blocks some of the light from the sun hitting your subject. The light hitting your subject becomes much more even and pleasing with no harsh shadows or reflections to mess with your exposure. You can use a white umbrella if you want. A reflector is simply a large reflective screen. They can be silver, gold, white or even black. These reflectors can be used to redirect light onto your subject. 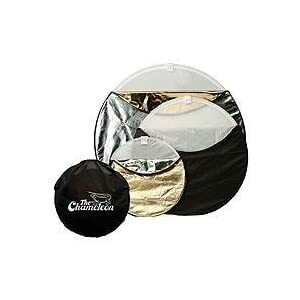 A gold reflector is very useful if you would like to have warmer tones in your photograph. I bought a diffuser-reflector set that I use all the time for macro photography. It has five reflectors and one diffuser, and it collapses into a small package that fits easily in my camera bag. I use the diffuser far more frequently than the reflectors, since I usually want to cut down on harsh lighting. But with some coordination, you can use both. Use the diffuser to cut down on lighting, and then use a reflector to redirect a little light back on your subject--whatever gives you the results you want. A tripod and cable release will free your hands so that you can use these instruments, but be sure cover the viewfinder if you're not looking through it when taking the picture.